Albatros Travel has been sending travellers to China for over 25 years and has created one of the largest adventure events in China: The Great Wall Marathon at Huangyaguan. In 2012, we established our own travel agency in China to be in closer contact with our suppliers and clients. Chinatoursandholidays.com is operated by Beijing Albatros Travel Service Co. Ltd, a travel company owned and run by Albatros Travel and IFU, a Danish government investment fund (www.ifu.dk). We focus on group tours, individual travel and business travel. The company goal is to create Chinese travel products with a touch of European characteristics. Our staff consists of Chinese and foreign employees. Because we have over 25 years of experience in providing quality tours and holidays for discerning travellers from all over the world. Our passion for travel, extensive local knowledge, attention to detail and adherence to quality are values we bring to all our customers. With our head office in Copenhagen, Denmark, and regional offices in China, Kenya, Tanzania, Namibia, South Africa and Greenland, we at Albatros Travel have been offering quality tours and holidays since 1986. We make sure that the genuine Albatros Travel quality - and spirit - is always present when you travel with us. Our tours offer you a great combination of Scandinavian quality and attention to detail, as well as local knowledge and a passion for what we do. When you travel with Albatros you know that you are travelling with a company that respects the people, the places and the wildlife you came to see. We believe that tourism should be sustainable – and not just in the narrow economic sense. On our tours we engage local businesses and employ local people, and we are more likely to accommodate our guests in small boutique hotels than large chain hotels that do little to benefit local economies. 'Albatros' is the Danish spelling of 'albatross' - the globe-trotting bird with the big wingspan. 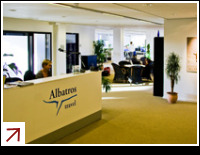 Albatros Travel takes great pride in remaining a family company. But we also have a ‘family’ of different brands and there is more to Albatros than you may think! From safaris and cruises, to Arctic voyages and Adventure Marathons on the Great Wall of China or Greenland’s Ice Cap, Albatros Travel spans the world with our unique packages to suit travellers everywhere. Find out more about the rest of our family: Albatros Travel Africa, World of Greenland and Albatros Travel Cruises. Read about us in Chinese.